Xiaomi Passport is a 20-inch solid, reliable and functional business cabin luggage with an innovative and minimalistic design. It is made of very good quality, practical, sturdy and reliable yet lightweight three-layered, hundred percent German Bayer polycarbonate material. 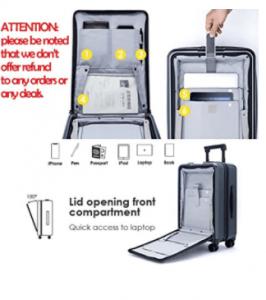 It has the four solid spinner wheels, dual TSA approved compatible locks and a unique and large multifunctional front pocket for personal items that you want to access easily. There is a built-in padded sleeve for storing up to 15-inch size laptop and iPad, and an elastic belt to keep your laptop or tablet in place. And you can put your iPad, tablet smartphone, wallet, books, magazines, passport, tickets and other items in its seven zipper pockets provided. You’ll find a zippered compartment on one side and cross straps on the other side to keep your belongings better organized and in place. There is not just one but two TSA-approved locks on this cabin bag, one for the main part and another for the front section. You’ll feel safer and have a peace of mind and the security control will be easier by the TSA staff at the airports. You can unlock these two TSA locks at the same time. It has a hard shell exterior that is resistant to scratching and impact or rough treatment by the airport staff. The 650D Oxford fabric is breathable and waterproof and the premium bars are used to strengthen the bag to better protect your belongings. It has a very sleek and modern textured surface with metal powder coating and modern finishing that makes it look stylish and elegant. The 360-degree rotating, dual solid and durable spinner wheels that are made of very elastic TPE material roll smoothly, quietly and effortlessly on different grounds. And they give you total control with also the help of the ergonomic and easy-to-hold aluminum telescoping trolley handle that locks at four positions. 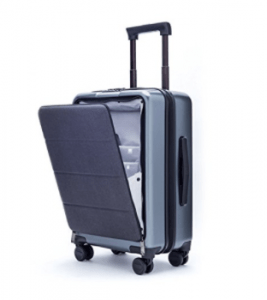 It measures 23.2 x 15 x 9.6 inches including the wheels and handles and is a good size as a cabin bag for most domestic and global airlines. And with its lightweight, you can put more stuff in without going over the weight restrictions and fit it in the overhead bin above you. XIAOMI is the biggest online luggage brand in China that has about thirteen years of history in travel luggage industry. And this great quality cabin bag has been put through compression, drop, endurance, lifting and impact tests, with 20kg packing weight in it.